The experienced eye of a commercial roofer can spot small details in the largest commercial roof, details which could spell trouble. From small depressions in the surface indicating compressed insulation to oval holes for mechanical fasteners indicating stress movement (and possible water infiltration), a highly trained roofer can see past the large-scale storm damage. Their laser-like focus is one reason to trust a professional roofer instead of your facilities crew with storm cleanup. After storms move through the area, it’s important to contact a roofing specialist for a storm assessment. The tell-tale signs of water leaks from storm damage may not show within your building for several weeks, but a local, reliable roofer can use state-of-the-art technology to “see” water damage and infiltration beneath layers of membrane or bitumen. Contacting your dependable Fort Lauderdale roofer the day after a major storm is a wise move. Emergency repairs may help hold damage to a minimum. Quick response by your roofer could allow your building to remain open, getting customer orders filled and keeping employees working. Early help from trained professionals will be far superior to the best efforts of your own facilities crew. Leave the major roof repairs of battling water, debris, winds and other menaces to your local, reliable roofer. No Fort Lauderdale business can thwart Mother Nature. Yet you can prevent the worst damage by taking a few precautions. Have your facilities crew members clear the roof of debris and loose items (spare pipe, coils of rope or wire, even brooms and squeegees) so the wind cannot lift these and gouge your roof, causing water infiltration. Assign your maintenance staff to do a quick inspection for loose flashing, missing mechanical fasteners, or split rubber boots. For real peace of mind, have your local roofer do a pre-season inspection before the worst hurricane season weather hits. A few dollars spent before a storm could save you thousands in storm repairs later. For expert storm repair on your company’s flat roof, turn to PSI Roofing. We have the years of experience in and around Fort Lauderdale to help you prevent storm damage and, if needed, provide emergency repair. Just about the most catastrophic event that can happen to the low-slope (“flat”) roof of a Fort Lauderdale business is for a hurricane or high wind to peel the roof off. It happens. It happens more often than any business owner would like. What can you do to protect your business when it is laid bare by Mother Nature? 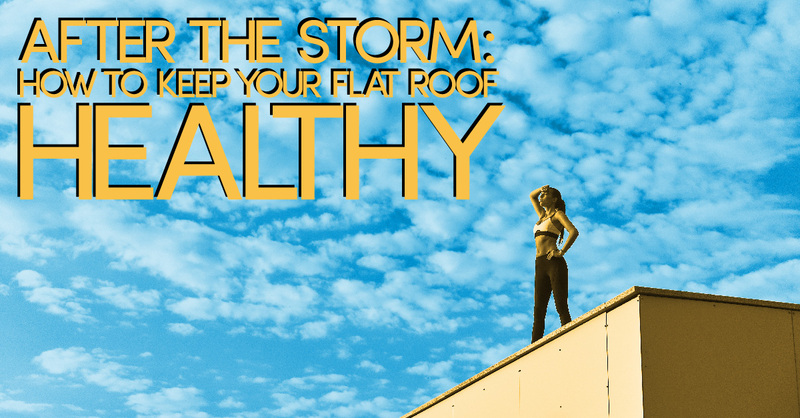 A complete loss of a flat roof — from high wind shear, a fast drop in air pressure from a hurricane, or a combination of wind and rain — calls for emergency roof repair. You not only need help fast, but you also need the right kind of help. Turn to a local, large-scale commercial roofer who can answer the emergency call with the right equipment, the right materials, and a crew of highly trained professionals. Ideally, you want a company large enough to have a dedicated service team to begin and stay on the job until it is finished, right up through final billing. Avoid placing your trust in a company so small your roof replacement overwhelms its systems. Avoid, too, the national franchise which cannot provide you with personal attention. A complete roof replacement is a costly claim. Your selection of a dedicated, reliable local commercial roofer is critical for a smooth claims process with your insurance company. If you’re unsure, ask your commercial insurance agent for recommendations of roofing contractors known by the area’s insurers to do high-quality, long-lasting work. The best way to keep costs and insurance premiums down is to avoid full roof replacement. One effective way to achieve this is to get a complete roof inspection before hurricane season or before a forecast of the really bad weather. Your maintenance crew can do some preventive work, but a local roofer will know to test mechanical fasteners, check on flashing and HVAC curbs, probe seams for potential uplift, and more. The inspection can be part of your ongoing roof preservation program, or it can be a single visit to assure your company’s roof can take the next bad blow. Contact the highly trained professionals of PSI Roofing whether you have just endured rough weather or you anticipate a challenging hurricane season. Our representatives can put together a complete program, describe our emergency services, and provide you with peace of mind. Contact us today!